An artist's rendition of the twin GRAIL spacecraft. A pair of robotic twins that have been diligently mapping the moon this year will go out with a bang Monday, around 5:28 p.m. EST. 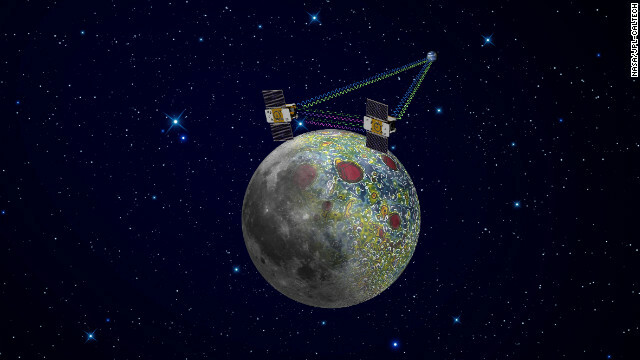 The Gravity Recovery and Interior Laboratory (GRAIL) probes Ebb and Flow will crash into a mountain on the moon Monday afternoon, ending a fruitful mission to study the surface and composition of the moon. "Scientifically we are learning a great deal about not only the moon but about the early evolution of terrestrial planets," said principal investigator Maria Zuber of the Massachusetts Institute of Technology at a press conference Thursday. Thanks to GRAIL, scientists now have the "highest-resolution gravity field map of any celestial body," NASA said. That means the probes have been making a high-quality map of the gravitational field of the moon, which give scientists unprecedented insight into what's below the surface and how the moon may have formed. Evidence that the crust of the moon is much thinner than scientists believed. Some of the large-impact basins dug into the moon's mantle, which is useful because scientists want to understand the moon's composition. It is believed that the composition of the Earth's mantle is similar to that of the moon. The moon's crust is much more fractured than scientists thought. It appears the crusts of planets have been bombarded in a similar way, including Mars. If there were water on Mars, as scientists believe there may have once been, where would it have gone? GRAIL, looking at the moon, provides a clue: "These fractures provide a pathway deep inside the planet, and it’s very easy to envision now how a possible ocean at the surface could have found its way deep into the crust of a planet," Zuber said. Another major finding: Identifying large, lava-filled cracks (dykes) which are hundreds of miles long and exist about 6 miles below the surface. There's no record of them at the surface of the moon. "These dykes actually provide evidence for early expansion of the moon shortly after it formed," Zuber said. "This had been predicted by models, but no evidence had been found." The aluminum content in the moon's crust is similar to what's found on Earth, which supports the theory that the moon was born when a Mars-sized body slammed into Earth. That body and Earth mixed so well that material thrown off into the moon is indistinguishable from Earth material. A side benefit of the GRAIL mission, Zuber said, is that scientists have improved their knowledge of the latitude-longitude grid of the moon. "If there is a place where a future robotic or human mission wanted to land, you would be able to do that extremely precisely," Zuber said. The spacecraft have performed "flawlessly," Zuber said, and it's all according to plan that they are running low on fuel. After Friday, the science instruments on board will turn off. The probes are about the size of a washer and dryer that would be found in an apartment, scientists said. The Ebb probe will crash at 5:28:40 p.m. EST Monday, followed by Flow about 20 seconds later. These impacts will happen in the dark. "We are not expecting a big flash or a big explosion," Zuber said, adding that the impacts will likely not be visible from Earth. Data collected by GRAIL between March and May has already been released; the rest will become available at the end of May 2013, scientists said. Scientists took care to not crash the probes into historic sites where humans have previously landed probes on the moon. Right now, the likelihood of hitting one of those sites is eight in 1,000,000, said GRAIL project manager David Lehman of NASA's Jet Propulsion Laboratory. "It's going to make a crater on the moon, and they're going to be completely blown apart at the time." Wow, superb weblog structure! How lengthy have you been running a blog for? you made running a blog look easy. The full glance of your web site is wonderful, let alone the content! Is it true that three planets will aline? Will the three planets aline 12/21/12? By studying the moons surface with these probes scientist now say this about the moon and Mars, "These fractures provide a pathway deep inside the planet, and it’s very easy to envision now how a possible ocean at the surface could have found its way deep into the crust of a planet," Zuber said." Are we going to someday frac the moon and Mars for water by just adding steam. who knows we may find oil? Wonderful! We mapped out the moon and just crash the probes into the moon. Great job, don't need to clean up your mess or anything. I guess if these guys can't litter the earth, they will just do it in space instead. So true! I was thinking the same thing. So much for keeping it as contaminant free as we can. Clean-up is exactly why the probes are being crashed into the moon. We don't want them to stay in orbit where they might interfere with future mission, nor do we want them to come down in some random place on the moon where they might damage a variety of sites of interest. Hey, at least we get to make another crater on the Moon! Think of it as very expensive landscaping! When will people understand this is not litter. If you're concerned about littering the universe, think about this: There are more stars in the universe than there are grains of sand on the Earth. Each galaxy has billions of stars with billions of planets, and the universe is home to billions of galaxies. To say that this is microscopic would be a enormous understatement. We can afford to put a probe on the moon but we can't afford to pay a teacher or a cop an honest wage. We could if the teacher or cop were on the Moon! DO NOT LOOK TO THE STARS! THAT IS WHERE I LIVE! NOW GET BACK TO PRAISING ME! almighty Zeus, with all due respect, put a cork in it ! Out of control probes a problem? Does anyone else realize that the actual probability that a historical sight is destroyed is 1/125,000? I know that's still pretty low, but it still sounds like a large chance. One in a quarter million isn't anywhere close to a high chance, and compared to what could be learned from the crash, the risk is more than worth it. No, it's like the article said, 8 in a million. You can't divide the million by 8 and get your odds of 125,000 to one because statistics doesn't work that way. Same thing with the odds of winning the lottery. If you have 1 in a million odds by buying one ticket you don't have 1 in 500,000 by buying two. acutually 8/1,000,000 divided by 8/8 (which equals one) is 1/125,000. Please know basic math before you try to correct someone. @ steverino... Please know your basic statistics before you correct someone. Getting odds isn't just a simple fraction simplification. Actually in this case its correct. 8 in a million IS 1 in 125k. That is how statistics work. Why crash them ? Just leave them where they are . The future explorations can either recover and put them to use or at least bring them to earth and keep it in a museum. Though its a tiny trash, why should we be the first to litter. Pad, that isn't how it works. I think I was in 2nd grade when I learned the basics. Who, what, where why and how. Did I miss something or did this article not explain WHY they're crashing the probes???? They crash due to orbit decay. They don't have the fuel to prevent it. GRAIL project manager David Lehman of NASA's Jet Propulsion Laboratory. It's the terms used by the GRAIL PM. THERE'S GOLD IN THEM THERE MOUNTAINS. G-O-L-D!!! We need to put more money in NASA. Where do you think all these new technologies and new jobs came from? NASA has always helped in the job creation business. If we allow more money into NASA, then NASA will be able to help in the creation of new innovation. Heck we probably be able to have a better economy if NASA had more funding. If Americans could pick and choose which departments their Federal Tax Dollars go to, you would see NASA's budget soar while the military's budget crumble. Shame NASA can't put on pledge drives, I would setup monthly donations. Although I would like to see NASA work with much lower budgets. Space X is building space components with a much, much smaller budget. and NASA has University's do alot of their exploration components for free and yet still spend ridiculous amounts of money. NASA's budget is incredibly small. I'm a huge proponent of space exploration and I want to see NASA grow, this story goes to prove instead how much money NASA wastes and how little they deserve more funding; I wish it didn't, but it does. These are 2 very well equipped, multi-million dollar machines, and NASA is destroying them willfully. Why not have sent them back towards the ISS, or shut them down early and kept them in perpetual orbit for later use. They're NASA, they're a collection of geniuses, they could have figured this one out. It bothers me to no end that they would so happily discard 10's to 100's of millions of taxpayer dollars. Shame on NASA. There are no 'perpetual orbits" around the moon; due to perturbations any object orbiting the moon will eventually crash. They are almost out of fuel, so flying them back to earth is not an option. They have performed their mission, and now decision to crash them in a controlled location is an easy one as it avoids contaminating any possible locations for future scientific investigation. That's like saying the Hubble Space Telescope should be used to find the composition of Jupiter's atmosphere. These probes are not designed to do anything else than what they have accomplished. We're $16 trillion in debt, we need to fix that before we invent ways to put us deeper in the hole. Are we going to someday frac the moon and Mars for water, just add steam? They never said the moon once had water, they are just comparing the cracks in the moon surface to the cracks on Mars, where there is a possibility that water on Mars went through the cracks on that planet. why did you make the cracks on Mars funnel water to the cracks on the moon? David Lehman of NASA's Jet Propulsion Laboratory. Read the article before you comment. What a nit-picker you are. CNN is using the phrase phrase 'blown apart' implying 'utterly destroyed', and of course that will be the case. And yes, they will be blown apart upon impact, just as aircraft which impact the earth are often blown apart...with a debris field often strewn over sevel acres. Drop you from a plane, without a chute, and your head will likely be blown apart by the impact..like the pumkin that it is. Why is CNN using the British spelling of the word "dike"? Why are we going to spend lots of money on satelites and then crash them into the moon? It's just a waste of time and money... why not reuse them for other things? re-use them for other things? these are very specialized craft built for a single purpose. It is a shame to see food used one time and then just flushed away. Emmy when you develop and try some recipes to stop this wasted post it here with your opinion of how it tasted. They have completed their mission. There is nothing to be gained with continued operation, nor can they be used for anything else. We got what we paid for. A) Reuse them for what? B) How do you expect to get them back to earth? I really hope English is not your first language because I have no idea what it is that you just tried to say. I suspect his job is writing the instructions for cheap electronics made in China. We so need to get off this rock..... wish we could take the entire defence budget funnel it into NASA – Instead we are slashing and killing programs right and left. going by some of the comments here, science is a thing of the past in our schools. Its bad to pollute the environment like this, space is a very sensitive environment, and its just like humans to pollute everything in their path, such a worthless race that we are. Please feel free to depart any time you wish. I highly suspect the post is a joke. How stupid can people be? I don't think anyone understands the actual size of the universe let alone the solar system. You actually think we're going to litter? This is scary to see how stupid people are. And you're mad about tax dollars? Do you understand how much more money it would have been if you wanted them brought back to Earth? NASA has created countless things that people use in their every day lives. Please, go back to elementary school and learn basic facts about the universe. I think you had better be the one to go back to school. If anyone is stupid it is the guy who says 'the universie is too big for us to litter' and then turns the moon to kitty litter. Look at all of the thousands of pieces of man-made space junk that orbit around the earth, any one of which being capable of bringing a satellite or space station down with one hit. Space junk could even kill by rippking through the head of some poor spacewalking asttronauuts.But 'Space is too big for waaaaahhhhh i am a republican!!!" Hmmmm.... have you ever gone spacewalking? Regardless of the answer you may want to check your own head for holes.Something has clearly ripped through your cranium and it needs to be repaired. Along with your brain. Or replaced. But that WOULD cost money, either from your own private insurance plan, driving up the cost of yours and other policies (oh how awful... Capitalism done-in!!!). It could cost the government to pay for your head-hole repair, location and assessment/diagnosis of such holes (driving up your taxes). You surely would not wish to drive up our taxes or costs, let-alone your own. Well if need be and you wish to continune to propogate space junking, do what you will and drive... up yours! And I'm also an 18 year old college student, not a republican, and just aced my astronomy class and am an astronomy major. And they asked me to be an assistant next year. So no, I don't need to go back to school to learn about the universe, I think I know what I'm talking about. You don't live in the reality that this is taking place in, Tut. It is ignorant to bring politics into this story. ust be Americans and you will be discusted with both dems and republicans. Both have their own agenda and neither are for the betterment of America. Fact: If you don't think space stuff is awesome, you're an idiot. Will this help lay to rest – once and for all – the theory that the core of the moon is hollow? inhabited by aliens? Sadly no this will not silence the conspiracy theorists. My prediction is they will claim all the NASA data is fixed in order to hide the fact that they are in league with the aliens who are living in the hollow moon ! What? You mean it is not made of cheese? What does the man eat then? I love writers with IQ'S of 75. Leave the moon alone !!! since when anyone has the rights to bombard the moon when they wished. There should be some kind of international council regulating what and when something gets blown in space. All "they" talk about is much supposedly needed research and its unseen benefits but never once about pollution and junk they are creating in space. By the time we will be ready to inhabit space colonies....they will be full of space trash. (buy a residential unit on moon..BONUS get a gas mask for the entire family FREE).....YEAH RIGHT! I know who should be the first person left on the moon! Wow! Moon Huggers make Tree Huggers look fairly sane. Poor moon, I hope the wonderful cheese you're made of won't be tainted. 😦 Gromit would be sad. Seriously though, even if the stupid (only today matters) humans make this planet practically inhabitable – all for the love of money and comfort of course – it will still be a paradise compared to ever living on the moon and if we someday have to move to the moon, or feel the need to colonize it for whatever reason, a little bit of scattered probe parts will be nothing compared to the radiation they'll get from the sun...unless they plan on living on the dark side...and good luck with that. I've said before that making the moon a toxic landfill for all human wastes would be a more than ideal solution and would affect absolutely no one, or anything...ever. That said, we've done more damage to our own planet by simply making the computer used to reply to this blog to worry about the moon and how we are hurting it. Take that silly moon defenders. Uhm, you DO realize there is no "Dark Side of the Moon" don't you? Pink Floyd notwithstanding. There is a 'far side' of the moon but it goes through day and night cycles just like the 'near side' does. Umm. Actually there is a dark side of the moon at any given time. The reason the spaceships are being crashed into the moon is to keep them from becoming space junk. You are an idiot for writing that and an even bigger idiot for thinking it would be funny. You gotta be kidding! The moon has been bombarded for the last 4.5 billion years with "space junk" much larger than these washer dryer size objects that will be hitting the moon. The resulting trash will be indistinguishable from all the other meteors, comets, etc. that have hit the moon in the past. Let's get serious and stop worrying about such inconsequential nonsense. And on the seventh day god created nascar. For he knew that teabaggers would watch shiny little objects going around in circles. Did they get permission from the Obama administration to trash the moon? Why do hillbillies like Halloween so much? Teabaggers love to boink their cousins every Sunday right after church. When are they coming out with "Google Moon?" LOL, good one. We can find the Starbucks much easier now. It has Google Moon and Google Mars already on there. I figured everybody knew that by now???? There is no room in space to let the garbage just float away, say, towards the sun. Yup. No room. Hey that is a good idea. Maybe in the future we could round up all the space junk and push it towards the sun. It could work. Sending the probe back out of orbit would require a bunch of extra fuel that surely would have added a bunch of $$$$ to the cost of the mission. Wouldn't it be better to let it crash on a remote mountain than to spend a ton of extra money to send it far off into space? If space is weightless then can't you give it a small push in the direction of the Sun and expect to keep moving in that direction untill it crashes? Abduhl: No, it would take more energy than they have to get it out of lunar orbit then more energy to get it out of the earth's orbit then far more than that to slow it down enough to reach the sun. The craft in orbit may not have 'weight" but it has "mass" which means it needs energy to change its orbit. 1. Flying into the sun. 2. Flying back to earth and disintegrating in the atmosphere. 3. Flying into the sun. Options 2 and 3 require a lot more fuel and money. The moon is relatively small but it does have gravity. (The mission measured gravity of the moon, after all.) It costs fuel to break orbit. The ships would still be in Earth's orbit and they would have to break from that to get to the sun. Bringing it back to Earth would require control so that they wouldn't end up as space junk orbiting Earth (as we have more than enough already). Trash Earth, now trash the Moon? Like a holler is West Virginny the washer and dryer will be tossed onto the side of a mountain. at least this time they can actually say they landed on the moon. Why now they think the crust is really thin on the moon when we had people walking and driving lunar vehicles all over it in the 60's. When they say "thin" what are you envisioning exactly? We're not talking eggshell here. It's differences in matter of degree. The deck of most bridges is extraordinarily thin compared to the planet that these bridges are on – yet, somehow, we don't go crashing through them. And that is not even what they are talking about in terms of "thin". What do you think is below this crust? A vacuum? Ocean? Cheese Soup? Here's the answer: It's more rock. Just mantle rock instead of crust rock. Even if it were nothing but cheese soup under that crust, the crust is rock. Go back up to the bridge analogy. Our bridges usually have nothing but air below them. Again, you don't go crashing through everytime you cross one with your car, right? I'm not even gong to try to address the absurd reassertion that we never went there. There is sooo much evidence that we did and no real evidence that we did not – everything that has been presented as "evidence" has been thouroughly debunked. Go read a book and learn somehting. I strongly recommend that you stay away from the Internet until you have learned how to think critically. There is a lot of garbage on this thing and it is harmful to people who cannot think clearly. I guess Lindsey Lohan works for NASA now? I heard that, because we plan on littering the moon, the inter-galactic litter patrol is planning on demolishing Earth on the 21st as punishment for violating the "Do Not Litter on Dead Worlds" act. No, that's not the reason. It will be demolished to make way for an interstellar freeway. Time to stick our thumbs out and hope for a ride. No no it was Moon paper scissors !! How can they do this without an environmental impact? Who is looking out for the rights of the moon? Rocks don't have rights. And what "environmental impact" do you envision on the surface of a rock with no biosphere? Do I think we should just cover the moon in trash, no. But get a grip. Read a book. Learn something. Dropping this used equipment onto a completely dead rock with the same surface area as the landmass of Earth means nothing whatsoever to anyone or anything anywhere. People thought the same of clear cutting the yellow pine forests that covered much of the southern US. Rosie, you don't live in the reality that this is happening in. I guess it's better than a probe that blows apart in Uranus. awesome. someone managed to squeeze in a Uranus joke. Actually, it was just a very juvenile comment. We'll never colonize the moon because too many people under 30 behave as if their IQ is the same as their shoe size. People who think saying "Uranus" is funny are perfectly content living in their parents' basement. Owlie - there's always room for a Uranus joke in a space story. Well played, Bester. Thanks NASA for wasting our tax dollars and polluting the moon. I love science just as much as anyone but think that taking care of the Earth and it's people is the only priority that humans should have. I can't help but wonder how much we spend on space but then have sick and dying people who could have used that money to live. I'm sorry to say but I'm ashamed of the things our government does and we the people have no say whatsoever. Ugh. Read my reply to JohnE below. This is the price of orbiting a science spacecraft around the moon. The satellites are running out of propellant, and the only responsible thing to do is crash it into a known location rather than have it crash randomly (and possibly into an Apollo site, etc). Yeah, it's too bad they can't have enough propellant to depart the moon's orbit altogether, but that would make their weight so much greater that the mission would have been unaffordable. But as the article states, each one is the size of a washing machine, and they'll litter a landmass of roughly the same area as the entire landmass of earth (without the oceans). Pretty small effect. Polluting? How does one "pollute" a rock that is completely free of a biosphere or ecology of any type? You can run for office and have a say. Otherwise be quiet. If you feel you have no say does that mean you don't bother to vote? This is one of the dumbest things I've ever read. Every day you're affected by something NASA has created. Theirs nothing new here ......both earth and moon were made from Micro- organism same as all planets. And now , we are puting our technology garbage in another satellites and planets ! like mars ! Why do rednecks like Halloween so much? Had some experience with that have you Billy? Why crash into the moon? We always tamper with things we have no business. Tweak nature like we know what we're doing. While I don't do the Azteca Calendar thing, one has to wonder wow, just a few days before that date and we're crashing something into the moon. Something which controls the gravity fields on the earth. Maybe we should go ahead and set off a nuke like we thought about years ago. Idiots, why would you even think of such a thing! Why do any science at all? Unless, could it be... that understanding our world and the solar system that surrounds it... IS our business. So much here that's funny (in a sad way)...but, "Azteca calendar"? Man, if stupid were a fuel, you'd be a nuclear plant. Wow, the moon controls earth's gravity? If you believe that, that is truly sad. The moon is the cause for tides buddy. Steve, I am cleaning up the Dr Pepper I spewed out on my LCD that was so funny.... Cheers to you. They had better be careful with that. It could be full of giant hornets. We have found evidence of a higher intelligences garbage on Mars. This is incredible we have already left garbage on the moon... why add more. I'm pretty sure it's called science. How about i take a dump on your lawn and call it a stool sample for your viewing pleasure science guy? 1) Taking a dump would fertilize the lawn, go ahead. You're certainly full of ... fertilizer. 2) What trash? Did you read the article about the probes being destroyed completely? You're like the person who doesn't understand implosion and thinks buildings will blow up when they're demolished. I'm more concerned about the millions of my tax dollars NASA spent to build these probes just so some geek can get a kick out of blowing them up. Really man? YOUR millions of tax dollars? I'm sure you funded the entire program... sure. im just going to keep posting this. This is what your tax dollars are "wasting." less than 1% of every tax dollar goes to NASA. The answer is simple: the spacecraft are running out of propellant. If you let them run completely out, their orbits will decay and hit a random spot on the moon, including somewhere we might not want them to hit (like an Apollo historic site). Instead, you can make a controlled descent such that they have a much lower probability of hitting one of those sites. So, no, these people aren't stupid, and it's not "for fun". THAT'S why we're paying the project the money it gets. Have some confidence in smart people everyone. Why? Because we can. To study the universe and understand it takes effort and demands that we do things in ways that we can with the technology at hand at the time. This is part of the mission. In a thousand years we may be able to do things differently but we are limited by our understanding of physics and technology. And on the 8th day God made the moon of cheese. Why are we wasting money finding out what kind of cheese moon is made of. This has been a conservative response. Has anyone ever noticed how the liberals are the ones throwing out the insults, yet they blame the conservatives for being trolls? And people seem to buy it? Yep. Conservatives NEVER hurled insults or called other people names. Not in the past year. Not in the past 50 years. Conservatives are good, god fearing people who would never speak ill of anyone. Unless those people were libtards or some such non-sense. That's okay then. I just don't "get it". Why crash them into the Moon ? Why not just leave them in orbit? Oh yes one last thing "GEEK-O"...IF we actually went to the moon, and these TWO gizmos made high resolution photography of the suface :SHOW ME THE MOON ROVERS AND EQUIPMENT LEFT BEHIND...Or is it still at Warner Brother's Studios ? The resulting explosions (20 seconds apart) may be to ignite a gas detected at this mountain location. And if that gas is helium-3, it won't ignite. Anyways, the key to this plan is the giant laser. It was invented by the noted cambridge physicist Dr. Parsons. Therefore, we shall call it the Alan Parsons Project. You really bothered to post this? It wasn't even a groaner. Do that again and you get sent to the Dark Side of the Moon for the rest of the lunar cycle! We don't want the North Koreans stealing our technology when they get to the moon. The "back side of the moon"??? The moon revolves on it's axis and we can see all of it over a period of it's rotation and movement in space relative to our planet. Where did you learn about the moon? Marvin the Martian? Rosie; it should be called the far side of the moon- because the way the moon orbits the earth we only see the same side of it. Google 'the moon' and you will learn that, and then be an adult and reply back to me and say that I was right and you were wrong. Let's just start dumping all of our trash on the moon. So far no one has come up with anything interesting. Just a few silly complaints about littering or something like that. The mountain is the site of a secret Soviet moon base that has been in existence since 1977. The US has finally discovered the exact location and these "research probes" have been waiting in orbit until the exact location was confirmed. Monday will put an end to a era of Soviet dominance on the moon. We are going to need a lot more weed here to make these kind of story connections. I think weed clouded his thought process. Boo hoo hoo- 2 objects the size of a small washer and dryer crash into the moon- look at what has been learned from the the probes- To all the cry babies, why not do something to improve the earth. Leaving whining messeges here will not improve anything. Ha ha ha. Nice name JIMBO! Thank you for your interest in science. You may now go home and stay there. The other children do not like you and will not play with someone of your low intellect. My cat would pee on you but then again it does not usually pee on something dumber than cat litter. Shouldn't they have scheduled this for the 21st? Anyone want to buy a Canon PowerShot A470 for $100 shipped? i do buck do you have paypal? No biggie. It's only our tax money. Good going Government. Touch my S.S and I'll send you to the moon!!!!!!! I hope none of those scientists left an envelope with their name on it in that stuff. If they did Officer Obie will just have to go and get a bunch of 8×12 colored glossy photographs to be used as evidence. But then how would we get the red VW microbus with shovels and rakes and implements of destruction up there to clean it up? Buck, sorry to tell you but if you're trying to be a comic then you're failing miserably and better do something else. Try smashing watermelons with a mallet in front of friends. You have zero joker talent. What happened to the breaking news a couple of weeks ago about Mars, not so breaking now, false alarm. If you want to make a milk shake, you are going to have to kill a few cows. What? You didn't know? The government has been looking for a place to start a new land fill. Oh funny, someone posted a false comment using my name. How clever. What, I am the original Buck, you imposter. Or maybe your multiple personalities are showing....? CNN breaking news folks: Syria and North Korea have joined forces and declared war on the United States...Now we dont need to worry about the moon because we wont be around to enjoy it. Good luck my fellow Americans, may god help us all. Oh dear, we are about to be attacked by ferocious gerbils? Head for the hills! I do agree this is a bad idea but they are out of fuel. Of course they planned to crash them on the moon for years now they just didnt tell the general public. Now Earth is a terrorist not just the people here. Ha! Yeah like they are going to fire the morons behind this ingenious plan, they should but it wont happen they are too afraid to take proper action. Lets face it people, Earth has blown it we are responsible for the death of the universe. Last I heard, there was no life on the moon. So how exactly is this a bad plan? Sorry I was being sarcastic, this is a bad idea and I think the person or people responsible for this should be condemned to die. Ok, based on your last comment you must be joking. No one can be that stupid. Thanks for the humor though. This has GOT to be a troll. Please, tell me it is a troll. Please. Is the president of the world ok with this, Barack? We want to rid the world of nukes as well so why not send them to the moon? This calls for a resignation, I call a formal protest. Are you people seriously getting all upset that they are "trashing the moon" here? If so then we have identified a much larger problem. Idiocy is spreading like a virus. I really hope that this is just a local troll outbreak. That would be a much lower grade of foolishness than actually worrying about a few hundred pounds of scrap metal on the moon. Look at the images that ebb and flow produced. The moon’s surface is a history of billions of impact craters, untouched by erosion. You won’t even be able to find ebb and flows craters. Even with a map. worse than a needle in a haystack. Woah, did I read that right? Now we are trashing the moon...not cool. I agree fire the person responsible for this. this is disgusting. we have already ruined our planet so now we are going to dump garbage on the moon too. whoever is in charge of this should be fired! if we keep doing this for 100 or even 1000 years the moon will be full of our trash. this can not be real what kind of morons are in charge of this? the sun is a better dump site than our precious moon, atleast the sun will burn it up but the moon? really? our childrens children dont deserve to have to suffer for our mistakes and this turns me off from my interest in the universe. this is in no way a reasonable solution, crash them here in the ocean...atleast we can clean it up and its more responsible. fire the morons behind this immediately! 🙂 funny rant. Almost sounds serious. Spend thrift NASA .. Send the probes to another Body to map . Missed the part about being out of fuel didnt you? They are out of fuel, they cannot be sent anywhere. Yeah, we'll just multiply the cost of this program by several dozen times and waste 10 times the resources in doing so. Seems sensible to me. Many Moons after The Demise of Earth ( 12/21/12 ) Alien life will label Man as The One who scattered His Junk across the Universe . well said and much appreciated i hope someone will listen. some guys get a reputation for spreading their junk all over town. NASA gets the universe? IMPRESSIVE! What is the point of adding space junk to the moon, Mars or any other place?!?! It should be crashed to Earth and collected then recycled!!!!!! Why not soft land them so we can come out of our hidden base on the far side of your moon so we can study the probes to see exactly what you earthlings were planning all along. Send this satellites to the Sun or so on..........why keep trash on the Moon. Did we not leave already trash with the Apollo's mission?? Why not call AAA and have them towed to a garage. Nature dumps literally thousands of times as much junk on the moon every year, in the form of meteorites, as the mass of these probes. The moon won't notice a fraction of one percent more. As for placing them in a more stable "parking orbit," that would have required that they carry far more fuel than they did, probably rendering the mission unaffordable. In addition, spacecraft operators already worry about collisions of "parked" satellites with active ones in Earth orbit; no need to start building up such an orbital "wrecker's yard," or more like "shooting gallery," around the moon! The best option is a "controlled deorbit," ensuring the probes don't hit historic sites on the surface and aren't left in orbit to hit other satellites; this is exactly what NASA is doing. Stop it already. You may as well argue the merits of Calvinism with a Catholic. This is not a forum for rational, logical exposition. 100 years from now a futuristic version of Fred Sanford will be selling the scrap metal out of his lunar junkyard. Couldn't they be left in orbit or moved to a more stable one. Seems a shame to drop all that alien material on a somewhat pristine moon. The buggies up there don't bother me quite as much though that too looks like the beginning of a wrecker's yard. I guess this is how that process begins. I heard that once they've got a big enough pile of junk on the Moon, they're gonna rename it "Upper Bridgeport, CT."
They are out of fuel so no,they can't be moved to a more stable orbit. Dead satellites are also a continuous hazard for any other active satellites, manned or unmanned so it's better to crash them now. Not really any different than a couple of meteor strikes, which already happens often on the moon. Comments about spoiling a pristine Moon always make me wonder about how illogical people can be. The Moon ain't nothing but a rock. I big rock floating in space. It has no atmosphere, no ecosystem. It's only features are millions of impact craters from other rocks that have struck it over the course of billions of years. Two tiny probes are going to crash into this giant, barren rock, and people are aghast. If we wanted to, we could set off dozens of nuclear explosions to study surface, and it would not matter one iota. Great. Way to trash it up. NASA is now run by hillbillies. They are used to leaving trash on mountain sides, especially old appliances. You really know a lot about these hillbillies don't you? From experience, I presume. Starting a new dump pad?? ?